Celtic boss Gordon Strachan hailed the spirit of his team after their 1-1 home draw with Manchester United in the Champions League. When United humbled Celtic 3-0 at Old Trafford, former Red Devil Paul Ince said it was like "men against boys". But Strachan said: "Technically they are a million miles away from us, but we showed tonight that we are men. "I am happy at 1-1. I am happy we gave them a good game. I am happy that we are not 'boys', as some people said." Celtic were without Jan Vennegoor of Hesselink, Georgios Samaras, Chris Killen and Aiden McGeady for the crucial match, absences Strachan feels damaged his team's chances as he sought to freshen up his side in the second half. Ben Hutchison came on for the last 10 minutes and Strachan said: "It was trying to deal with players who were tired. We tried to keep Scott McDonald on but that wasn't possible. "I put on my seventh-choice striker and played three centre-backs and tried to hang in there at the end. "There was a lot of thinking to be done, chopping and changing, because there weren't replacements for certain positions. "With a wee bit of luck it could have been an incredible upset. At least we made them work for it tonight." Celtic lost 3-0 in the first Group E game last month in Manchester. 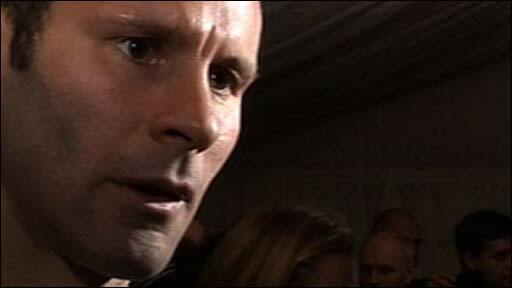 After that defeat, Ince, now Blackburn manager, said the gulf between the two clubs had been "embarrassing" and it was a game "between men and boys". Strachan hit back after the draw at Parkhead on Wednesday, which saw Celtic take an early lead through McDonald's lob before Ryan Giggs claimed an 84th-minute equaliser. "Whatever we are, we are men," said the Celtic boss. "You cannot play like that if you are not men. We should never be called 'boys', that's for sure, because boys don't fight like that." Given the absences from the starting 11, Strachan was relieved his players had given the English and European champions a contest: "We got out of here with pride. If we had our full team, it would have been a far better game. "We had a system against Feyenoord this year that worked well, with Samaras, Jan and Aiden, and the three of them are sitting in the stand. "How would they get on without Rooney, Berbatov and Ronaldo? I am sure it would have been easier than it was tonight." 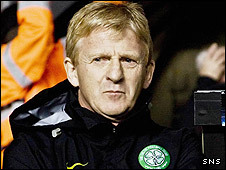 Referring to the tremendous atmosphere created by the Celtic fans, Strachan said: "It was rocking. It is the best in Europe on a night like this." A fan came onto the pitch during the game, causing the match to be stopped for a few moments. Strathclyde Police said a 19-year-old man was detained in connection with the incident, and would appear before Glasgow Sheriff Court on Thursday.